What Would Be The Ultimate Car/Product Tie-In? News today of the 2009 Ford Super Duty Cabela's FX4 reminded us of automakers' love of the car-and-product tie-in. Whether a Levi's Gremlin or an Eddie Bauer Explorer, we have a fondness for the Strange Special Edition car. We've asked you about your favorite trend cars, but what about the special editions that we haven't thought of yet? Imagine you're a product planner for an automaker. What special edition vehicle do we need?There are a few obvious choices. 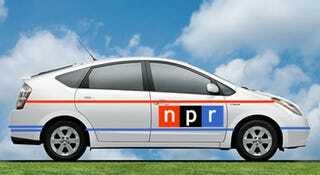 An "NPR Edition Toyota Prius" complete with pre-programed NPR channels and a set of This American Life CDs would be awesome. Cover the seats with tote-bag canvas and you've got a winner on your hands. What about the "Axe Body Spray Hummer H2?" If you're not into hilarious or ironic special editions, what about something truly awesome like an iBook-themed Audi wagon? What would be the ultimate car/product tie-in?